Galway-based auctioneers O’Donnellan & Joyce secured record prices for a number of houses placed up for auction on Tuesday in the Harbour Hotel. The first property to go under the hammer was a three bedroom duplex at No 57 Lios Ealtan, Nile Lodge, Lower Salthill. Bidding commenced at €140,000 and within a matter of minutes was sold to a delighted purchaser for €165,000. The second property was a semi-derelict house at No 14 Lower Canal Road, Galway. Bidding commenced at €160,000 and increased in increments of €5,000, and the property was placed on the market by auctioneer Colm O’Donnellan at €175,000. Five individuals chased the property and bids increased rapidly throughout the room until it was left to two interested parties interchanging bids in increments of €5,000. Eventually it was sold at €325,000 to tumultuous applause from the packed auction room. The property was in need of substantial refurbishment and this would be regarded as a record price for this location in the last five years. The next property was a four bedroom detached residence at No 95 Caiseal Cam, Roscam, which attracted five interested parties. Bidding commenced at €245,000 and within a period of three minutes it was placed on the market by auctioneer Colm O’Donnellan, having reached the reserve price of €266,000. Bids increased rapidly in increments of €2,000, until eventually it was sold for €330,000. The fourth property was a three bedroom semi at No 101 Cimin Mor, Cappagh Road, Galway. Bidding commenced at €160,000, and when it looked as though it was about to be sold at €175,000 a fresh bidder entered the fray at €177,000. Bids then increased rapidly between two interested parties until it was sold for €203,000. The fifth property was Funshinaugh, Cross, Co Mayo. Bidding commenced at €20,000 and the property was placed on the market immediately by the auctioneer. Bids increased in increments of €2,000 until eventually it was sold for €56,000. The next property was No 1 Dun Daingean, Newcastle, a four bedroom detached residence on a corner site which attracted two interested parties. Bidding started at €320,000 and increased in increments of €5,000 until the property was sold for €350,000. The seventh property to be auctioned was No 3 Roslevin Court, Athlone, a mid-terrace residence in need of refurbishment or modernisation. Bidding commenced at €25,000 and increased in increments of €2,000. The property was chased by a number of interested parties and was sold at €43,000. The next property was No 127 River Village, Athlone, a three bedroom mid-terrace residence. Bidding started at €40,000 and increased in increments of €2,000 with five individuals chasing the property. It was sold for €66,000. The ninth property was a site in Athlone with no planning permission. Bidding started at €10,000 and it sold for €20,000. A two bedroom apartment at No 10 Custume Pier, Athlone, was sold prior to the auction. A detached house, Mallrey House in Doughiska, saw bidding commence at €320,000 and increase in increments of €5,000. The house was sold for €355,000. According to Colm O’Donnellan of O’Donnellan & Joyce the auction team were absolutely delighted with the incredible interest there was in all of the properties, particularly in Galway city properties where currently there is enormous demand. 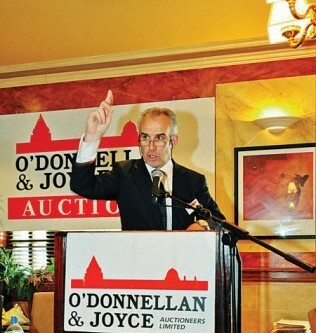 O’Donnellan & Joyce will hold its next auction on March 14 2014. Further particulars can be had by contacting the auction team on (091) 564212.